Shopping for Nightmare Before Christmas T-Shirts? Your favorite character from Tim Burton's The Nightmare Before Christmas! Black t-shirt with a cool Jack Skellington design. Features The Nightmare Before Christmas logo and Jack in his unmistakable tuxedo! Featuring The Nightmare Before Christmas' Jack Skellington in his stellar black tuxedo, probably gazing at his true love Sally from afar, the Nightmare Before Christmas Dark Love Black T-Shirt makes a perfect, easy gift for any Tim Burton or Disney fan. 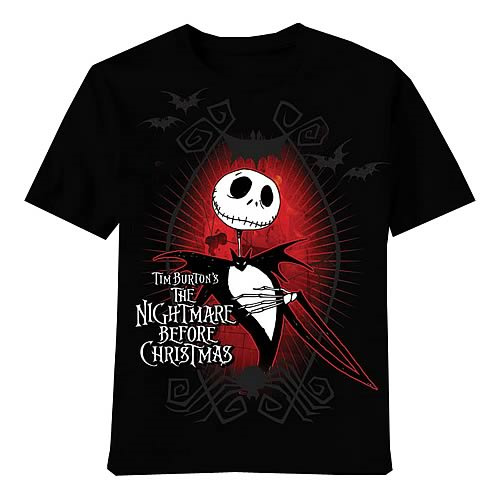 With bats flying above a Jack highlighted by a red backdrop and the movie's logo, you won't find a more definitive The Nightmare Before Christmas t-shirt. Whether you're buying it for a friend or you want this awesome Nightmare Before Christmas Dark Love Black T-Shirt for yourself, you'll love its classic look!